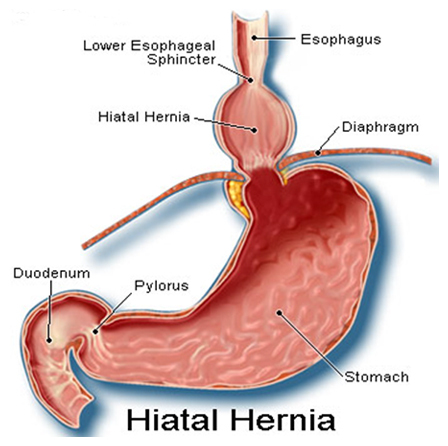 Hiatus Hernia India offers information on Hiatus Hernia in India, Hiatus Hernia cost India, Hiatus Hernia hospital in India, Delhi, Mumbai, Chennai, Hyderabad & Bangalore, Hiatus Hernia Surgeon in India. Hiatus hernia is a common diagnosis of the upper digestive system that can affect individuals with varying degrees of severity. To understand this disorder it is helpful to learn normal anatomy and the abnormal changes that produce this condition. The diaphragm is a thin, flat muscle separating the chest from the abdomen. It regulates respiration by moving up and down. For any structure to pass through the diaphragm, there must be an opening, referred to as a hiatus. 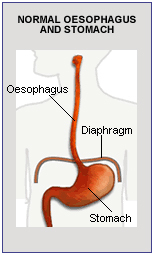 The esophagus, a muscular tube, propels food from the mouth to the stomach with regular contractions. It runs through the chest, behind the lungs and heart, and through the tight esophageal hiatus in the diaphragm to enter the stomach. 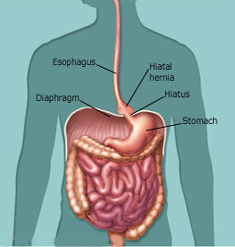 Normally, the hiatus is reasonably tight and grips the esophagus just above the stomach. At this point, the esophagus wall is thicker and a muscle at this site contracts, forming the lower esophageal sphincter (LES). 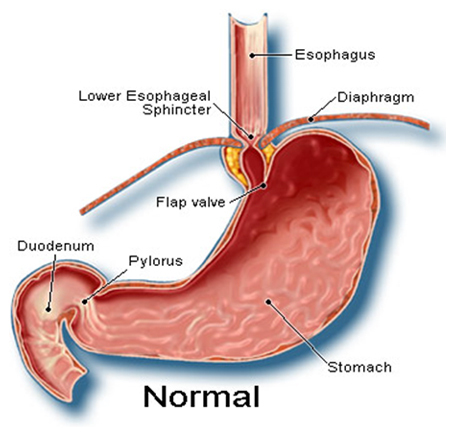 After swallowing, the LES opens, allowing food passage through to the stomach and then it usually closes quickly, staying in a closed position, and preventing food or acid in the stomach from refluxing back up into the esophagus. In some people, for reasons not yet fully understood, the opening in the diaphragm becomes wider than usual. When this occurs, the lower esophagus is out of normal position and the upper part of the stomach pushes up through the enlarged opening, producing a hiatus hernia. Commonly, a portion of stomach moves up and down through the hiatus, producing a sliding hiatus hernia. Most of the time, the cause is not known. Some people develop a hiatal hernia after sustaining an injury to that area of the body; others are born with a weakness or an especially large hiatus. Some experts suspect that increased pressure in the abdomen from coughing, straining during bowel movements, pregnancy and delivery, or substantial weight gain may contribute to the development of a hiatal hernia. In most patients, hiatus hernias cause no symptoms. This is especially true of sliding hernias. When symptoms occur, they may only be heartburn and regurgitation, when stomach acid refluxes back into the esophagus. Some patients with fixed hiatus hernias experience chronic reflux of acid into the esophagus, which may cause injury and bleeding. Anemia, or low red blood cell count, can result. Further, chronic inflammation of the lower esophagus may produce scarring and narrowing in this area. This, in turn, makes swallowing difficult, and food does not pass easily into the stomach. 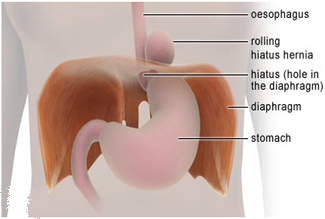 There are two main types of hiatus hernia. This is the most common type, affecting eight in 10 people with a hiatus hernia. The hernia occurs when the top part of the stomach, called the gastro-oesophageal sphincter, slides up through the diaphragm. This type affects only about two in 10 people with a hiatus hernia. It involves part of the stomach bulging up through the opening in the diaphragm, while the gastro-oesophageal sphincter stays below it. It is also sometimes called a para-oesophageal hernia. Diagnosis of a hiatus hernia is typically made through an upper GI barium x-ray. A complementary test is gastroscopy, or upper-intestinal endoscopy, in which the physician visually examines the esophagus and stomach using a flexible scope while the patient is lightly sedated. Two main pharmacological approaches to treating hiatus hernia with medications are neutralizing acid and blocking acid production. Many people find that non-prescription antacids (which neutralize acid in the esophagus and stomach) can provide quick, temporary, and/or partial relief. Antacids are short acting and do not prevent heartburn. Over the counter antacid medication such as Maalox®, Tums®, and Rolaids® may help initially. If you find the need for antacids for more than 3 weeks, then consult a physician. If the above milder measures do not work for you, there are some other options. These two classes of medication block acid production. H2-RAs work by blocking the effect of histamine, which stimulates certain cells in the stomach to produce acid. These include cimetidine (Tagamet®), ranitidine (Zantac®), famotidine (Pepcid®), and nizatidine (Axid®). H2-RAs are all available as prescription medications and some are available in a lower dose, over-the-counter without a doctor’s prescription. Proton pump inhibitors (PPIs) are a newer class of medication. They work by blocking an enzyme necessary for acid secretion. These include omeprazole (Losec®), lansoprazole (Prevacid®), pantoprazole (Pantoloc®), esomeprazole (Nexium®), and rabeprazole (Pariet™). In Canada, these medications are available only with a prescription. PPIs have emerged as the most effective therapy for relieving symptoms and improving quality of life, as well as healing and preventing damage to the esophagus in people with hiatus hernia. Treatments that reduce reflux by increasing LES pressure and downward esophageal contractions are metoclopramide and domperidone maleate (Motilium®). All of the medications discussed above have specific treatment regiments, which you must follow closely for maximum effect. Usually, a combination of these measures can successfully control the symptoms of a hiatus hernia. If not, PPI maintenance may be the answer, or surgery, such as fundoplication, may be tried; however, these measures may be only partially effective. How is a hiatus hernia treated? A hiatus hernia, particularly a small one of the sliding type, is generally a common condition that does not cause many symptoms or problems and your doctor will be able to advise you on the best way to avoid complications. This type of hiatus hernia does not usually cause obstruction or strangulation so surgery is very rarely required. If your hernia is causing symptoms of gastro-oesophageal reflux, your doctor may direct treatment at solving the symptoms of your reflux. They may recommend you try self-care measures that can help reduce discomfort or pain. These will probably include changes to your lifestyle or diet including weight reduction if you are overweight. If these don’t help, however, your doctor may advise medication as the next step. Medications used to treat gastro-oesophageal reflux symptoms include the following. Over-the-counter antacids. These are available from pharmacies and include calcium carbonate (e.g. Andrews TUMS Antacid), aluminium hydroxide (e.g. Alu-Tab) and mixtures containing several preparations (e.g. Gaviscon, Gelusil, Mylanta). Antacids ease pain by working against the excess acid in your oesophagus to neutralise it. They won’t stop the acid from being produced, so be aware that if you stop taking them, it’s very likely your symptoms will return. Histamine blocker medications (known as H2-blockers or H2-receptor antagonists) reduce the amount of acid your stomach secretes. They include cimetidine (brand name Tagamet); famotidine (Pepcidine); nizatidine (Tazac); and ranitidine (Zantac). Small packs of ranitidine (Zantac Relief) are available from the pharmacist, but if your symptoms are severe, your doctor will probably advise stronger doses of H2 blockers, which are only available on prescription. Proton pump inhibitors block the production of acid and so allow the tissue that has been damaged by the acid to heal. They are usually very effective medicines and doctors consider them safe for long-term use. Proton pump inhibitors include lansoprazole (Zoton), omeprazole (Losec, Acimax), esomeprazole (Nexium), rabeprazol (Pariet) and pantoprazole (Somac). A rolling hiatus hernia is not as common as a sliding hiatus hernia, and is much more likely to cause obstructions and strangulations and so are more likely to need corrective surgery. Surgery is not common and is usually only necessary to repair large hernias or hernias in people who haven’t been helped by medication or who are getting complications from their hernia, such as obstruction of the oesophagus, severe pain, or bleeding. 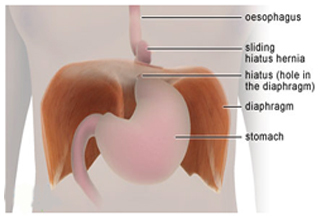 pulling the stomach back down into the abdomen under the diaphragm;tightening the opening in the diaphragm where the oesophagus passes through;strengthening the muscles in the lower part of the oesophagus;attaching the part of the stomach that has bulged through the diaphragm to the back of the abdominal wall; orattaching the top few centimetres of the stomach around the oesophagus to prevent heartburn. 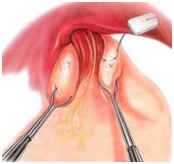 The surgery may be either open or laparoscopic (‘keyhole’) surgery. In most cases, surgery for hiatus hernia has good results. If you are experiencing symptoms from your hiatus hernia, your doctor can generally treat the problem easily and advise you on ways to minimise any discomfort. In addition, the complicated hernia can cause serious problems such as difficulty in breathing or severe chest pain, especially in the elderly.